Some time ago my brother and I built a LED matrix watch. Now is the time to upgrade the watch and enable weather prediction functionality based on changes in the barometric pressure, and at the same add a humidity sensor. The construction is build around a PIC18F2620 from microchip, a bmp805 barometric pressure sensor and a DHT22/AM2302 humidity sensor. You can use this module for your own construction through serial communication, my brother has compiled a comprehensive description in the user guide. Update: We have implemented a better weather prediction service based on changes over a period of the last 3 hours inspired by Freescale Semiconductor application note AN 3914, we store and display the last five hours calculations with graphical symbols. New is also the ability to configure what measurements you want the watch to show, look in the user guide in the project files for a more comprehensive explanation. Obs! remember to update the LED watch to newest firmware to enable these functions. 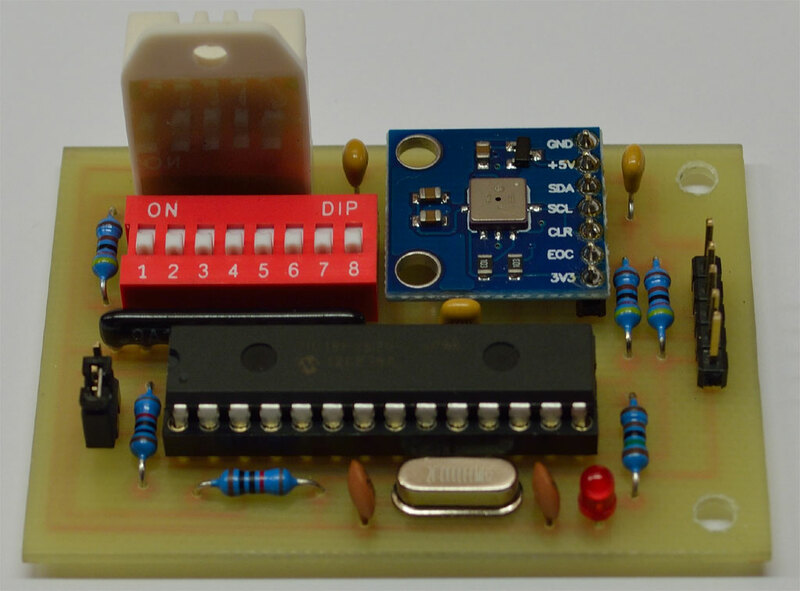 The add-on pcb with all components mounted. The construction is build around a PIC18F2620 and predict how the weather will be through dp/dt changes in barometric pressure.